Two week ago, I wrote about walking around the churchyard at Saint Mary’s Cathedral, Limerick, and how I came stumbled across the simple and humble grave of Prince Milo of Montenegro, facing the great west door of the cathedral and looking out onto the banks of the River Shannon. Prince Milo Petrović-Njegoš (1889-1978) was a prince of Montenegro and was a direct descendant of Radul Petrović, brother of Danilo I (1670-1735), the first Vladika or Prince-Bishop of Montenegro from 1696. After a life of exile in Italy, Shanghai and California, he eventually settled in Ireland, and died in Barrington’s Hospital in Limerick in 1978. Prince Milo never realised his dream of restoring the Monenegrin throne, which was abolished in 1918. But now, almost a century after the fall of the royal house of Montenegro, newspapers around the world have been reporting in recent days on the arrest of a 57-year-old Italian conman who has been charged with fraud and forgery after posing for years as a member of the Royal Family of Montenegro. 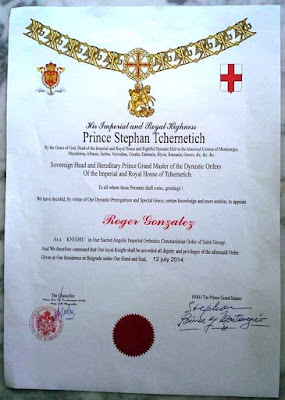 The man, whose real identity has not yet been revealed, calls himself ‘His Imperial and Royal Highness Stefan Cernetic, Hereditary Prince of Montenegro, Serbia and Albania,’ and claims to be a descendant of the Emperor Constantine, and the head of the royal family of Montenegro. He is such a convincing conman that he has hoodwinked and fooled many royals and celebrities. He travelled across Europe in a luxury black Mercedes flying Montenegrin flags and fake royal insignia, and stayed in luxury hotels, free of charge. To make his claims even more credible, Cernetic set up a website and several social media accounts, where he regularly posts photographs of himself alongside known royals, like Prince Albert of Monaco, and members of famous aristocratic families, like Savoy, Hapsburg and Hohenzollern. His Royal and Imperial Highness, as descendant of S. Constantine the Great and of the Emperor of Constantinople Angelo, Comneno, Ducas, Paleologo, Lascaris, Vatatze is holder and guardian of the heraldic knightly heritage of his House and as such fons honorum, precious evidence of a glorious past, that is alive and propelled to the future, carrying on values without wich (sic) the present has not roots. Yet this man’s elaborate charade has been effective for many years. He attends receptions organised by real royal families and pretenders. Earlier this month, he shared a table with Princess Irena of Greece and Denmark, in Athens. He has met bishops in the Vatican, patriarchs in their palaces, and attended lavish parties on yachts. The Mayor of Monopoli in Italy, Emilio Morani, has hosted a reception in his honour, and he managed to get Baywatch star Pamela Anderson to kneel before him two years ago as he bestowed on her the title of ‘countess’ in a solemn ceremony. The Hollywood actress was also named ‘Great Lady of Montenegro’ and her children received the title of knights. He bestows ‘the nobility titles of Noble, Hereditary Knight, Baron, Viscount, Count, Marquis, Duke, Prince’ to anyone who is silly enough to pay for them. He also doles out five different chivalric orders to anyone who is naive enough to pay for them: the Imperial Equestrian Order of Saint Hubert; the Imperial Orthodox Equestrian Order of the Holy Sepulchre of Jerusalem; the Dynastic Equestrian Order of Merit ‘Goldener Doppeladler’ (Golden Double Eagle), the Imperial House Cernetic; the Angelico Sacro Imperiale Equestrian Order of Saint George Orthodox Constantinian; and the Cernetic Imperial Order. It is curious that orders that claim to be Orthodox use Latin lettering on their insignia. But this is probably a minor quibble for those eager to buy baubles to wear to the ball. He claims his ‘official residence’ is in Belgrade, some of his Facebook accounts indicate he lives in Monte Carlo, but he seems to spend most of his time in Italy. His self-styled Highness appointed an honorary consul who travelled around Europe as his royal ambassador. But Maurice Andreoli is a total fake too. After his arrest Italian police revealed the ‘prince’ is not from the Balkans, but from Trieste and his parents are Italian. He was being paid to attend public events and even had his own brand of wine in Tuscany. Confusing Macedonia and Montenegro is a laughing matter even in table quizzes in pubs. Confusing them when you are trying to avoid paying your hotel bill and claiming royal status is beyond belief. Italian police raided the homes of the fake prince and his ambassador, and found several fake titles and awards, diplomatic permits and a royal seal. His arrest was widely reported last weekend. But by Monday, he was on his way from Milan to Rome by fast train, boasting he was travelling with ‘diplomatic discount’ and ‘Club Class’ Italo. He was in Monte Carlo by Tuesday, it would appear from his Facebook page. Has he managed to get away with it? 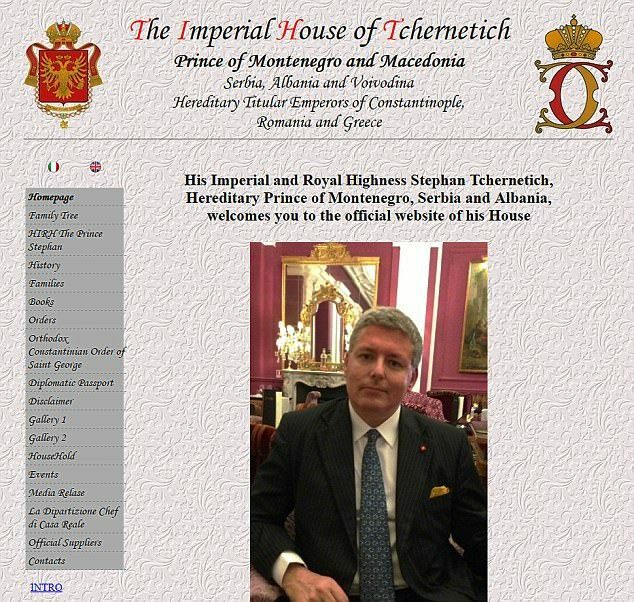 Stefan Cernetic, if that is his name, is not a member of any royal or imperial house, and certainly not the head of one. He has no connections to the royal houses of Montenegro, Serbia, Macedonia, Albania or anywhere else. The titles and orders he bestows are as bogus as his claims. On some of the parchments handed out with his gongs he describes himself in true Ruritanian style as ‘His Imperial and Royal Highness Prince Stephan Tcherneitch, By the Grace of God, Head of the Imperial and Royal House and Rightful Dynastic Heir to the Historical Crowns of Montenegro, Macedonia, Croatia, Dalmatia, Illyria, Romania, Greece, &c.
That must come as news to the people of Greece, who decided democratically to reject all royalty in 1974, and are still disturbed by another would-be-king who is waiting in the wings. The ‘&c’ is a little worrying, that I would worry too much about this claimant. If the Macedonian and Montegrin embassies are sending back his hotel bills, is he going to start forwarding them to the Irish embassy in Rome? Perhaps the ‘&c’ may even refer to Royal Meath and the Kingdom of Kerry. Who knows? Everyone knows Macedonia has no royal family waiting in the wings to accede a throne if the electorate is ever barmy enough to want a king. Count Gyula Cseszneky, a Hungarian-Croatian aristocrat who collaborated with Fascist Italy and Nazi Germany, was proclaimed Grand Voivode or Grand Duke of Macedonia but reigned for less than two months in August and September 1943. In fact, the former Yugoslav republic only started calling itself Macedonia in recent years, much to the chagrin of the majority of people in Greece. It has only existed as a state since 1991, and when it was part of Yugoslavia, it was also known as Vardar Banovina. The last king of Croatia, Tomislav II, was an Italian prince who collaborated with Nazi Germany. He became king at the request of Ante Pavelić, the leader of the fascist Ustaše movement in Croatia. Montenegro, Serbia and Albania have living pretenders who continue to claim they are the rightful royals in those Balkan nations. But Montenegro has not had a royal family since 1918. Nikola II Petrović-Njegoš is the current head of the House of Petrović-Njegoš, making him, in royalist eyes, the true pretender to the throne of Montenegro. He is a second cousin once removed of Alexander II Karađorđević, the current head of the House of Karađorđević and the man who wants to recognised as King of Serbia. Leka II of Albania is the current head of the House of Zogu, the royal house of Albania. He is the grandson of King Zog I and currently works for the Albanian Foreign Ministry. Someone, somewhere, must be wondering whether Prince Milo is turning in his grave in Limerick.